Looking for Transportation to Disability Advocacy Day? There are several organizations that can assist you in getting to Disability Advocacy Day on March 20th. Several Independent Living Centers are coordinating transportation. Check out the Map to find a participating ILC in your area. 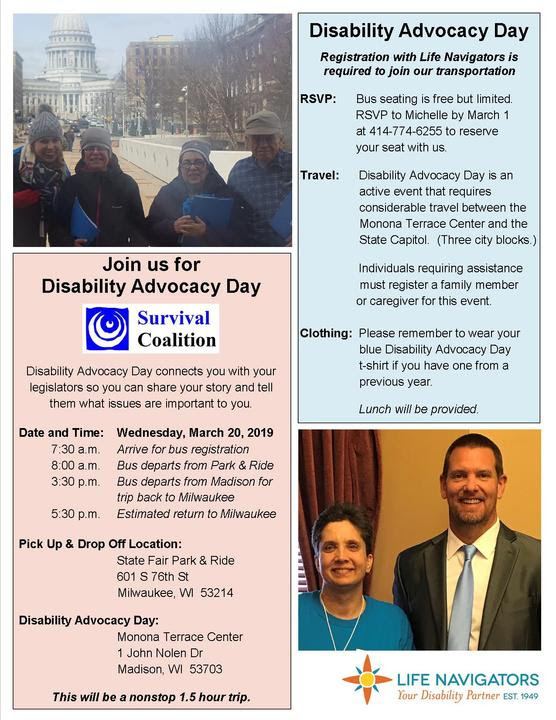 Disability Advocacy Day is a day-long event focused on connecting Self-Advocates with their legislators to talk about issues that matter to them. Attendees are expected to participate in the full day of activities. Direct Care Workers attending to assist you for the day must register for this event. Additional people must complete their own registration form. Use your HOME/VOTING address to register. Business addresses or PO Boxes are not allowed. No on-site registration or walk-ins. Participants must attend the 10:30 a.m. briefing at the Monona Terrace Convention Center. Attend your legislative visits at the scheduled time with your group. your legislative visit for you. Don’t forget your Blue Disability Advocacy Day T-Shirt!